Zoonoses are infections or diseases that can be transmitted directly or indirectly between animals and humans. Verotoxin-producing Escherichia coli (E. coli)can be acquired through contact with infected farm animals. assessing the risks throughout the food chain for human health and also the risks for animal health and making recommendations on the prevention and reduction of food-borne zoonoses. EFSA analyses monitoring data on zoonoses, zoonotic micro-organisms, antimicrobial resistance, microbiological contaminants and food-borne outbreaks across the EU. The Authority is assisted by the Network on Zoonoses Data Collection: a pan-European network of national representatives of EU Member States, other reporting countries, as well as the World Health Organisation (WHO) and the World Organisation for Animal Health (OIE). EFSA also provides guidance to national authorities on how to carry out monitoring and reporting activities on zoonoses, food-borne outbreaks and antimicrobial resistance. EFSA produces baseline survey reports on the prevalence of zoonotic micro-organisms in the EU in foods and specific animal populations. The findings are used by risk assessors such as the Panel on Biological Hazards (BIOHAZ Panel) to provide risk estimates and also by risk managers to help set reduction targets for zoonoses in the food chain and to monitor progress towards achieving these. EFSA provides scientific advice on animal health-related aspects of non-food-borne zoonotic diseases and in some cases on the possible impact on public health. EFSA’s Panel on Animal Health and Welfare (AHAW Panel) has among others assessed the risks posed by avian influenza and Q fever, and provided advice on possible control and mitigation options. 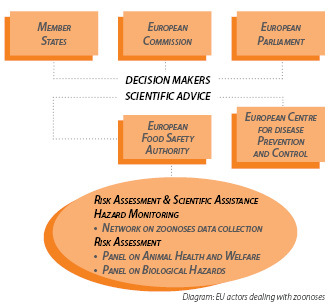 Other EFSA Panels, such as the Panel on Biological Hazards, may also be involved in scientific work related to non-food-borne zoonotic diseases. Based on data collected by the EU Member States, EFSA produces in cooperation with ECDC annual European Union Summary Reports on zoonotic infections and food-borne outbreaks monitoring the evolving situation in Europe. The monitoring and control of zoonotic diseases is regulated by EU legislation on zoonoses and communicable diseases. The EU has set up systems of collecting and analysing data from Member States on the prevalence of zoonotic agents in humans and animal populations. The data provides a basis for developing control measures to prevent and reduce the prevalence of these micro-organisms in animal populations. According to EU legislation, many communicable diseases, such as Q fever have to be notified by Member States to either national authorities or the European Commission. They are managed by various control, eradication and prevention measures. The EU has also set out specific rules on the surveillance, control and eradication measures to be taken in the event of an avian influenza outbreak.